Tamar is feeling like the fourth wheel, so she is trying to make sure she has allies in the house. Tom wanted Joey went home, but he didn’t think it was going to be six, zero. It was like a blindside in his favor. Natalie Eva Marie thought they had the numbers to keep Joey in the house, but just before the live vote, Tamar had second thoughts. Natalie Eva Marie tells Tamar that she better make sure that her girl, Kandi doesn’t have a change of heart and align with the men. Tamar promises that she has her word. Tamar goes to speak to Kandi, she says that the other two women have too much power and they need to get them out. Tamar tells her just to keep to the story that they are going to put up Tom and Kato if they win HOH. Time for the HOH competition. This competition is called picture imperfect and they have to find what is wrong with Big Brother’s favorite magazine covers. 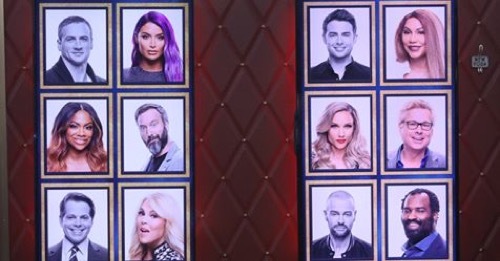 They will play two by two and the last player standing will be the next HOH. Everyone wants to beat Tom and Kato, they only have to beat Kato to win. Ricky and Tamar are first. Ricky is eliminated. Kato and Kandi are next, Kandi is eliminated. Lolo and Natalie are up, Natalie is eliminated. Next, it is Dina and Kato, Dina is eliminated. Tamar and Lolo are next, Lolo is eliminated which means it is all done to Tamar and Kato. Tamar is first to ring in and she is the winner and the new HOH. Tom thinks they are screwed, but he still has some fight left in him. Time for the nominations, Tamar puts up Tom and Kato. She calls Kato a big threat and she tells Tom that it is nothing personal. Kandy asks Tamar if one of the guys wins the veto, who is she going to put up on the block. Tamar says Natalie or Lolo, Kandi tells her to put up Natalie. Tamar thinks Natalie is a little smarter, a little hungrier, she has the eye of the tiger and should be the one to go up. Time for the Veto competition; Tamar, Tom, Kato, Lolo, Dina, and Kandi will play. The players watch comedian Gallagher as he smashes various food items and they splatter all over the houseguests, thank goodness they are wearing goggles. Hopefully, they are paying attention because the items he is smashing probably has something to do with the competition. Everyone heads to the backyard. Julie is going to ask them a series of true or false questions base on the Gallagher performance. For every correct answer, they will win one point. The player with the most points will win the POV. Lolo wins the POV. Time to begin the Veto meeting. Lolo decides not to use the POV and to keep the nominations the same. Julie has one last piece for the houseguests, she cannot tell them who won the super bowl, But, she can tell them that there was a mystery power given by America to one houseguest, that power was not used and has officially expired. Time for the live vote. Tom and Kato get a chance to plea to the houseguests for their vote to stay in the house. Ricky is up first, he votes to evict Kato, Kandi for Kato, Dina for Kato, Lolo for Kato, Natalie for Kato. It’s official with five votes to evict Kato and zero votes to evict Tom, Kato is evicted from the Big Brother house. Julie asks Kato if he is surprised, he says yes. He says he didn’t know Tom before this but they have become close friends now. She asks him if it was smart to have wanted to target Ricky, he says they had two opportunities that they didn’t take. She asks him why he aligned with Lolo and Natalie, he says because they are so beautiful.